Heat oven to 375 F. Spray 12 regular size muffin cups with cooking spray. In a small bowl, mix crabmeat and 1/ 2tsp seafood seasoning; set aside. In a skillet, heat oil over medium-high heat until hot. Cook onion and peppers in oil 4 minutes, stirring frequently. Add crabmeat mixture, stirring until mixture is heated through. Cool 5 minutes; stir in cheese. In medium bowl, stir baking mixture ingredients with whisk or fork until blended. Spoon 1 scant tbsp baking mixture into each muffin cup. Top with about 1/4 cup crab mixture. Spoon 1 tbsp baking mixture onto crab mixture in each muffin cup. Bake about 30 minutes or until toothpick inserted in centre comes out clean and tops are golden brown. Cool 5 minutes. With thin knife, loosen sides of pies from pan; remove and place top sides up on cooling rack. Cool 10 minutes longer. 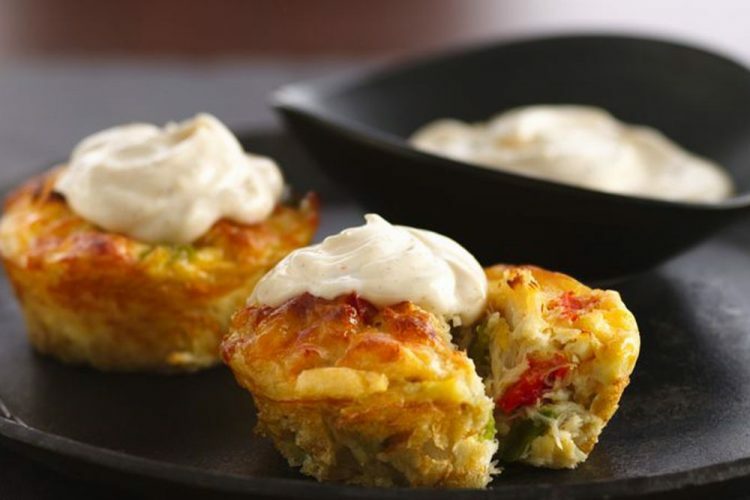 While crab cake pies are cooling, in medium bowl, mix aioli ingredients. Serve each mini pie topped with generous tbsp of aioli. Tips â Grease and flour cups if you donât have cooking spray. Use fish seasoning if you canât get seafood seasoning. You can substitute crabmeat with lobster, fish, salt fish or even chicken. Simply switch seafood seasoning to chicken seasoning. Mild cheddar cheese works just as well as mozzarella.